It is a cloudy night in July on the Colorado Plateau as it has been for most of the 10 days and nights I have been in Torrey. Yesterday it rained 1.3 inches, an impressive amount in a place that averages under ten inches per year. The clouds make for a good time to post the object I acquired last month around the time of the new moon. SV80ST set up with ring mounts holding the guide scope and guide camera on top. Telrad star finder on far side. As I posted earlier, this past March Kirsten and I drove to California to meet with our new author Sasha Paulsen in Napa. On the way back I pulled over in Auburn to grab a cup of coffee and casually mentioned over lattes that there was a small telescope manufacturer in town called Stellarvue. Kirsten whipped out her smart phone, looked them up, called the owner Vic Maris and told him we would be over shortly. What is a guy to do but to buy a new telescope? 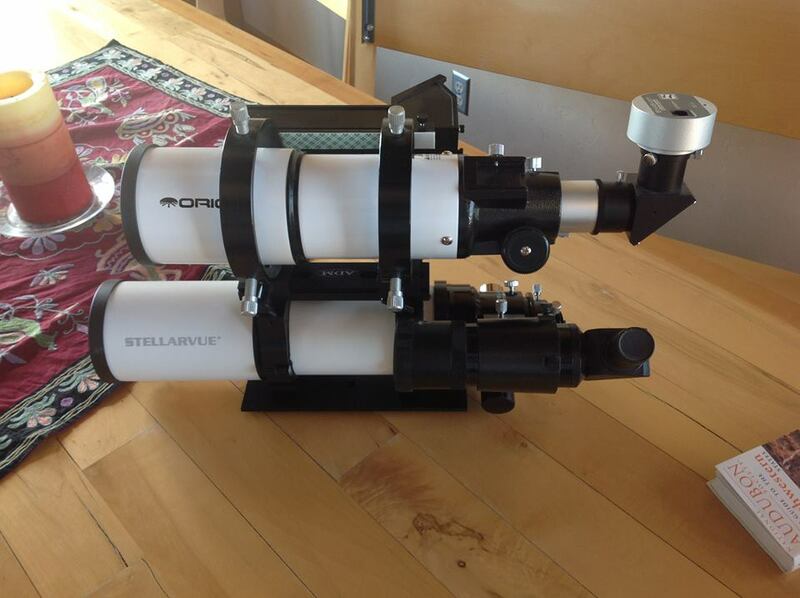 The Stellarvue SV80ST-25SV is a refracter scope (my (Dad’s) C8 is a reflector) with an 80 mm front aperture and a 480 mm focal length making it an f-6 speed. The fully multi-coated 3 element objective lens are why it is called a triplet. The three lenses and the coatings make it apochromatic, thus APO, and low light dispersion. In some of my recent captures I used my 80mm guide scope as the camera lens and the C8 as the guide scope. I was getting bloated stars with noticeable blue halos. 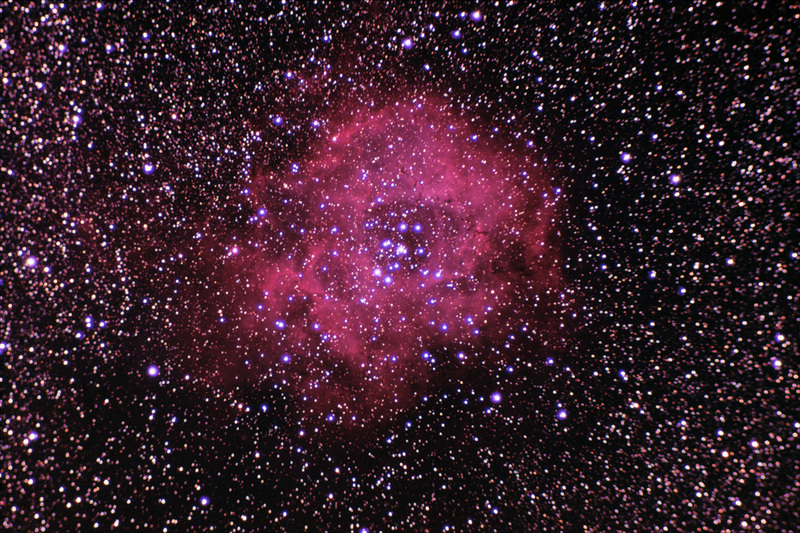 See my Rosette Nebula for an example. It made for a pretty but sloppy picture by current amateur standards. I liked the wide field to fit the larger nebulae and star groups into the frame but was getting tired of the compromised results. The Stellarvue seriously cleans all that up. We ordered the telescope, a field flattener and some mounting hardware and headed for Salt Lake. A week or two later one of Vic’s techs called me to say the telescope was done and ready to ship and that it had come out with nearly perfect scores on their bench test. So much more cool than ordering a China made scope from Amazon. The first night out with the new scope I tried to find the Elephant Trunk nebula (IC1396) but it was not an object I could see with the finder scope and I couldn’t even tell on the first photographs if I was getting it. 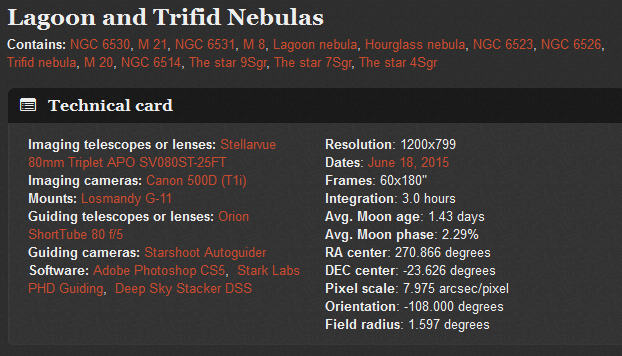 I think I did, but it was very vague and I decided to go for something easy, a nebula viewable with the naked eye on a dark night, the Lagoon nebula and its neighbor nebula to the north, the Trifid. 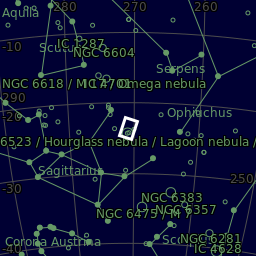 The nebulae are both in the constellation Sagittarius a bit above the teapot’s spout. Both are thought to be four to six thousand light years away. 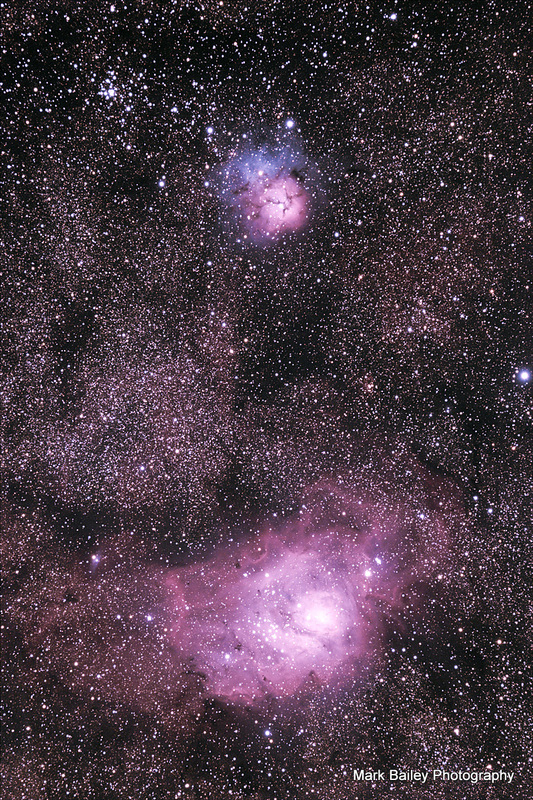 The Lagoon and the lower red part of the Trifid are both star forming regions. The Trifid, the upper nebula in this image, is a combination of an open cluster, an emission nebula — the red portion like the Lagoon — and a reflection nebula, the blue portion. An emission nebula is caused by ionized gasses that emit light and a reflection nebula are clouds of interstellar dust reflecting the light of the bright, young, nearby stars. I captured this image over two nights for a total of six hours of exposure. I am a little disappointed what little difference the second night’s three hours added to the first night’s. But I remain happily dismayed by the power of the free software I use to stack the separate frames all together in one image. In this case the the software not only has to combine all the sub-frames but also has to line up the slightly different framing of the images from the first night to the second. No problem. 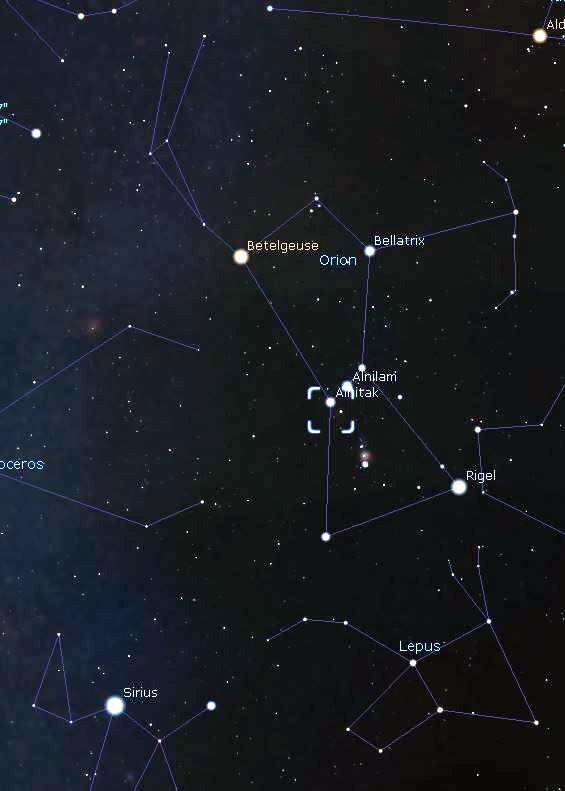 I borrowed the star chart on the left from another free website called Astrobin.com. You can see the first nights capture posted on Astrobin here. 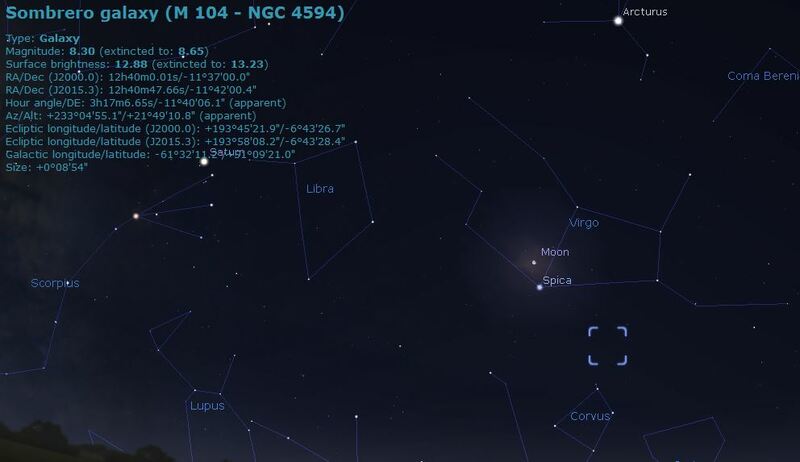 The amazing magic of that site is that it takes the posted image, identifies where it is located on a star chart and names the objects contained in the image. On the same night I experimented with a new very wide angle 14mm lens (generous wife again) to capture a Milky Way panorama over the house. That post next time. This entry was posted in Astrophotos, Star Stories and tagged astrophotography, deep sky objects, Lagoon nebula, Stellarvue, Trifid Nebula on July 15, 2015 by Mark Bailey. I was inspired to shoot this object with about twice the usual exposure by Scott Rosen of Astronomers Do It In the Dark.com. You can see his award winning image of the same object here. Scott primarily uses the same Celestron C8 Schmidt–Cassegrain reflector telescope that I use and he seems to be well known in the amateur astro-photography world. So much for excuses. He has the same general equipment but also obviously possesses some processing skills and software I don’t have. But one other factor I noticed is that he gets in a lot of exposure time, usually two to four times as much as I have been getting. On this shot I got about six hours and tried for nine but, as Joni Mitchell might say, clouds got in the way. I realized another technology step to make shooting life a little easier. Rather than traipsing back out during the shoot to see if all the tech goodies are properly functioning I started using TeamViewer on an iPad to stay on the couch and check on the PC running the show out in the driveway. Better to prolong a nap until shooting is completed. The Sombrero Galaxy is a spiral galaxy with an unusual central bulge and a prominent dark dust lane, thus the sombrero moniker, and is known to have a super massive black hole at its center. The light that reached my little camera sensor is about 28 million years old. 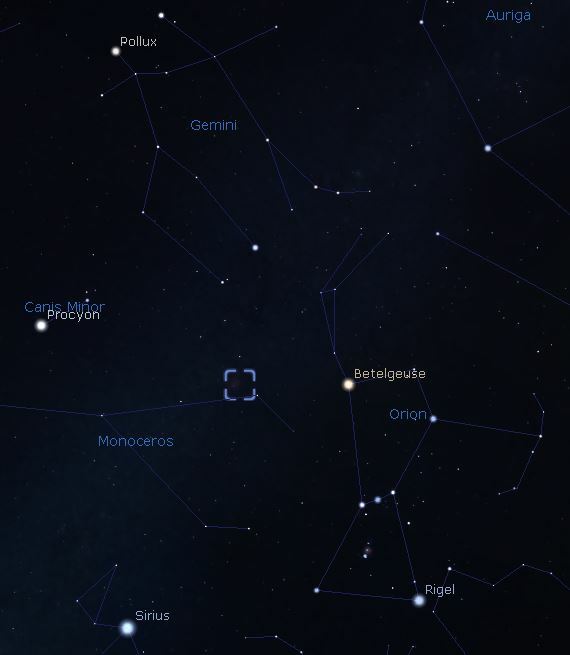 M104 is located in the constellation Virgo. 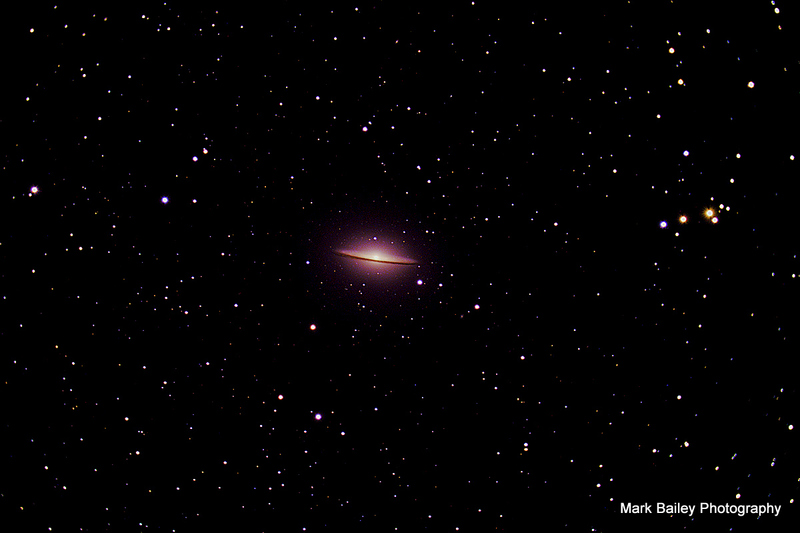 My M104 Sombrero image is a six hour and three minute exposure made up of 121 three minute subs. I used 20 flat, dark and bias frames. This entry was posted in Astrophotos, Galaxy, Star Stories on June 18, 2015 by Mark Bailey. The Horsehead Nebula is part of the vast Orion Nebula complex. Just below the first star in Orion’s belt the head itself is actually a dust cloud obscuring the bright red nebula behind it. This dark molecular cloud is about 1500 light years away. It was pretty much a perfect night for viewing in Torrey. 35 degrees and wind mostly calm. Later there seemed to be some high thin clouds but for most of the time I was out the sky was black, the Milky Way was prominent, the stars were so bright that even with no moon I could see my shadow, and Orion ruled. 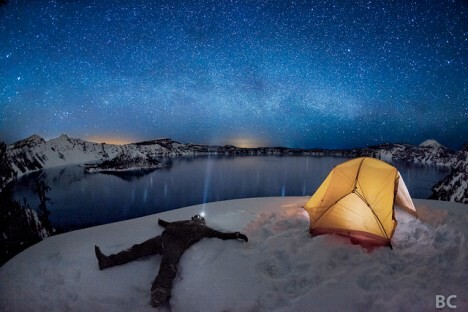 It was the kind of night where there are so many stars it is hard to pick out the constellations. 35 degrees is not quite cold enough that I wear insulated pants, but I do have on thick hiking boots, a puffy down parka I bought in maybe 1976 with the hood up over a ski hat, a headlamp set to red light, and finger-less fishing gloves. I still get a little chilly. I usually set up to the east of my home in Torrey in the driveway in order to stay out of the prevailing westerly winds. The house is 2 stories high there and is an effective wind break but also gets in the way of viewing. I didn’t quite have 2 hours left to shoot after I set up before the belt wheeled behind the roof. 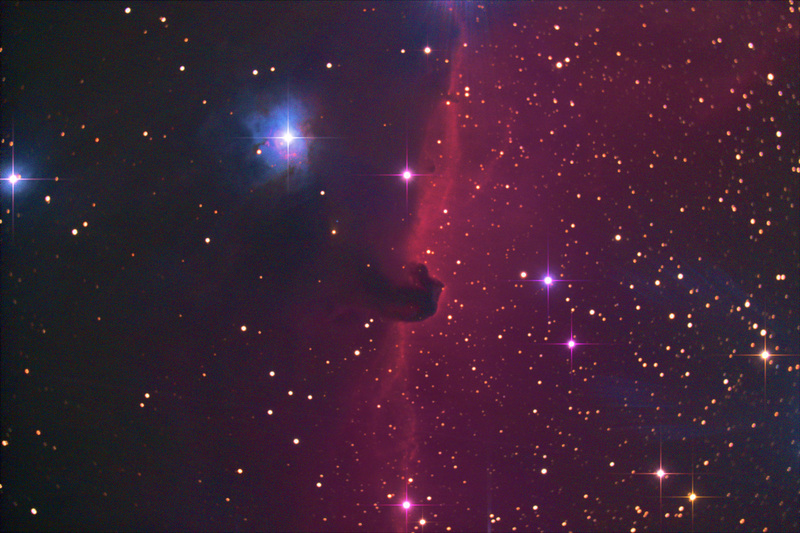 The Horsehead image is a one hour and 45 minute exposure made up of 21 five minute subs. I used 8 flat and dark frames and forgot to get the bias shots. This entry was posted in Astrophotos, Colorado Plateau, Star Stories and tagged Horsehead Nebula, Orion Nebula on February 18, 2015 by Mark Bailey. This is my first deep sky object capture in a while and the first after modifying my camera to accept more red in the Ha wavelength. This cosmic rose is about 5,000 light years away near Orion in Monoceros. The red is nebula matter (hydrogen?) that is heated up by the hot stars in the center of the Rosette which formed from the same matter. I love the feedback loop here, sort of like we mortals becoming conscious. The stars form from the cosmic matter and then shine back on it, making it beautiful. The stardust that is we humans becomes conscious and looks out on the heavens, becoming the cosmos aware of itself, and is beautiful. I tried to get this picture Sunday night but got blanked out by a strange, stuck cloud. A rare failure in the forecast by the amazing Mr. A. Danko at ClearDarkSky.com. As part of the weird weather we are having (very weird, exactly as predicted by the global warming models), the jet stream is distorted and was blasting down with much turbulence in the upper atmosphere out of due north and created a standing lenticular cloud exactly in the way of where I needed to observe. Monday night was much better although it did not clear up until after dusk. Good of it. In fact, Monday night was great, clear and calm, but a surprisingly cold 24 degrees. For the first time the laptop PC I was using to run the exposures quit on me at the end of the session, apparently from cold, and would not start back up. I took it inside for half an hour, fired it up, and was able to go back out and get the rest of the compensating sub frames (darks, flats and bias). This exposure is what the hobbyists call “first light.” I recently sent my Canon Rebel T1i off to Gary Honis for his full spectrum modification which replaces the internal stock infrared filter with a special clear glass filter. Many nebula have a red wavelength called hydrogen-alpha that is filtered out by the stock camera filter. I chose the Rosette as my first object to gather some of that red I was missing. In fact, in an attempt years ago to acquire the Rosette with my stock Canon 10D, I either missed the thing altogether, something that is entirely possible, or all the red was filtered out. I shot through the guide-scope and guided with the normal telescope, the reverse of what is normal. The guide-scope is a relatively simple and inexpensive telescope that is not meant for astrophotography. The stars are much fatter and distorted than they would be and the little blue circles around the stars are from the various color wavelengths not converging all in the same place. Still, as long as you aren’t experienced at such efforts, the end result is purty. This exposure is 2 hours and 32 minutes comprised of 4 minute subs and using 8 each of darks, flats and bias frames. This entry was posted in Astrophotos, Colorado Plateau, Star Stories and tagged cleardarksky.com, gary honis on February 17, 2015 by Mark Bailey. This entry was posted in Conservation, Dark Sky, Environment, Star Stories, Value of Wilderness on October 7, 2011 by Mark Bailey.